Definition at line 1594 of file wingdi.h. Definition at line 1625 of file wingdi.h. Referenced by ApplyDisplaySettings(), bInitPDEV(), DrvGetModes(), EngpPopulateDeviceModeList(), GetPossibleSettings(), GetSystemColorDepth(), InitializeDialog(), IntInitScreenInfo(), PDEVOBJ_pdmMatchDevMode(), ProcessUnattendSection(), RegWriteDisplaySettings(), START_TEST(), test_EnumDisplaySettings(), UpdateRefreshFrequencyList(), UserChangeDisplaySettings(), wined3d_set_adapter_display_mode(), and WinMain(). Definition at line 1622 of file wingdi.h. Definition at line 1618 of file wingdi.h. Definition at line 1608 of file wingdi.h. Referenced by PRINTDLG_ChangePrinterW(), and PRINTDLG_UpdatePrintDlgW(). Definition at line 1609 of file wingdi.h. Referenced by pagesetup_set_defaultsource(), PRINTDLG_SetUpPaperComboBoxW(), and PRINTDLG_WMCommandW(). Definition at line 1595 of file wingdi.h. Referenced by convert_to_devmodeA(), DataObjectImpl_CreateComplex(), DrvGetModes(), EngpCreatePDEV(), EngpPopulateDeviceModeList(), GdiConvertToDevmodeW(), IsValidDevmodeW(), PRINTDLG_ChangePrinterW(), PRINTDLG_WMInitDialogW(), START_TEST(), test_EnumDisplaySettings(), and test_flushed_getdata(). Definition at line 1615 of file wingdi.h. Referenced by EnterFullScreen(), and RegWriteDisplaySettings(). Definition at line 1629 of file wingdi.h. 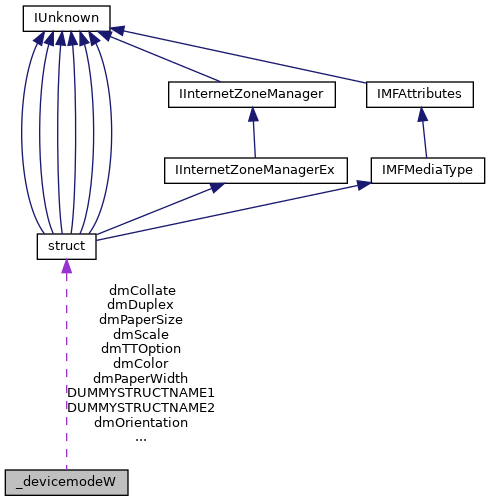 Referenced by DrvGetModes(), RegWriteDisplaySettings(), and wined3d_set_adapter_display_mode(). Definition at line 1632 of file wingdi.h. Referenced by ApplyDisplaySettings(), bInitPDEV(), DrvGetModes(), EngpPopulateDeviceModeList(), GetPossibleSettings(), InitializeDialog(), IntInitScreenInfo(), PDEVOBJ_pdmMatchDevMode(), ProcessUnattendSection(), RegWriteDisplaySettings(), UpdateRefreshFrequencyList(), UserChangeDisplaySettings(), wined3d_set_adapter_display_mode(), and WinMain(). Definition at line 1614 of file wingdi.h. Definition at line 1599 of file wingdi.h. Referenced by _LocalGetJobLevel2(), _LocalGetPrinterLevel2(), _LocalGetPrinterLevel8(), _LocalGetPrinterLevel9(), convert_to_devmodeA(), DataObjectImpl_CreateComplex(), DocumentPropertiesW(), DrvGetModes(), DuplicateDevMode(), EngpPopulateDeviceModeList(), EnumDisplaySettingsExA(), EnumDisplaySettingsExW(), GetPossibleSettings(), GetSystemColorDepth(), IsValidDevmodeW(), NtUserChangeDisplaySettings(), NtUserEnumDisplaySettings(), pagesetup_change_printer_dialog(), pagesetup_get_devmode(), pagesetup_set_devmode(), PrintDlgW(), START_TEST(), test_ChangeDisplaySettingsEx(), test_flushed_getdata(), update_devmode_handleW(), and WriteJobShadowFile(). Definition at line 1597 of file wingdi.h. Definition at line 1619 of file wingdi.h. Definition at line 1600 of file wingdi.h. Referenced by ApplyDisplaySettings(), DrvGetModes(), EnterFullScreen(), IsValidDevmodeW(), PDEVOBJ_pdmMatchDevMode(), PRINTDLG_ChangePrinterW(), PRINTDLG_UpdatePrintDlgW(), ProcessUnattendSection(), START_TEST(), test_ChangeDisplaySettingsEx(), test_GdiConvertToDevmodeW(), UserChangeDisplaySettings(), and wined3d_set_adapter_display_mode(). Definition at line 1623 of file wingdi.h. Referenced by convert_to_devmodeA(), GdiConvertToDevmodeW(), IsValidDevmodeW(), PRINTDLG_WMCommandW(), and START_TEST(). Definition at line 1624 of file wingdi.h. Referenced by bInitPDEV(), convert_to_devmodeA(), GdiConvertToDevmodeW(), and IntInitScreenInfo(). Definition at line 1630 of file wingdi.h. Definition at line 1603 of file wingdi.h. Referenced by pagesetup_get_orientation(), pagesetup_set_orientation(), PRINTDLG_ChangePrinterW(), and PRINTDLG_WMCommandW(). Definition at line 1605 of file wingdi.h. Definition at line 1604 of file wingdi.h. Referenced by pagesetup_get_papersize(), pagesetup_set_papersize(), PRINTDLG_SetUpPaperComboBoxW(), and PRINTDLG_WMCommandW(). Definition at line 1606 of file wingdi.h. Definition at line 1627 of file wingdi.h. Referenced by ApplyDisplaySettings(), bInitPDEV(), DrvGetModes(), EngpPopulateDeviceModeList(), EnterFullScreen(), GetPossibleSettings(), InitializeDialog(), IntInitScreenInfo(), PDEVOBJ_pdmMatchDevMode(), ProcessUnattendSection(), RegWriteDisplaySettings(), START_TEST(), test_ChangeDisplaySettingsEx(), UpdateRefreshFrequencyList(), wined3d_set_adapter_display_mode(), and WinMain(). Definition at line 1626 of file wingdi.h. Definition at line 1613 of file wingdi.h. Definition at line 1610 of file wingdi.h. Definition at line 1607 of file wingdi.h. Definition at line 1598 of file wingdi.h. Referenced by _LocalGetJobLevel2(), _LocalGetPrinterLevel2(), _LocalGetPrinterLevel8(), _LocalGetPrinterLevel9(), ApplyDisplaySettings(), convert_to_devmodeA(), DataObjectImpl_CreateComplex(), DocumentPropertiesW(), DrvGetModes(), DuplicateDevMode(), EngpPopulateDeviceModeList(), EnterFullScreen(), EnumDisplaySettingsExA(), EnumDisplaySettingsExW(), GdiConvertToDevmodeW(), GetPossibleSettings(), GetSystemColorDepth(), InitializeDialog(), IsValidDevmodeW(), NtUserChangeDisplaySettings(), NtUserEnumDisplaySettings(), pagesetup_change_printer_dialog(), pagesetup_get_devmode(), pagesetup_set_devmode(), PrintDlgW(), ProcessUnattendSection(), START_TEST(), test_ChangeDisplaySettingsEx(), test_flushed_getdata(), test_GdiConvertToDevmodeW(), update_devmode_handleW(), UserChangeDisplaySettings(), wined3d_set_adapter_display_mode(), and WriteJobShadowFile(). Definition at line 1596 of file wingdi.h. Referenced by convert_to_devmodeA(), DrvGetModes(), and GdiConvertToDevmodeW(). Definition at line 1621 of file wingdi.h. Definition at line 1620 of file wingdi.h.